This week, the KDE developers are again heavily focusing on readying the soon-to-be-released KDE Software Collection 4.6. Bug fixes can be found throughout the stack and in a wide range of applications. Equally many bug fixes are going into extragear applications such as Amarok, the KDE Development stack, and KDevelop itself, as well as into KDE-PIM and the KDE office suites. There are also a number of optimizations in various areas. Few and rather small features are added to KDE SC, mainly in Marble, Calligra, and the graphics applications. RSIBreak is preparing for release. 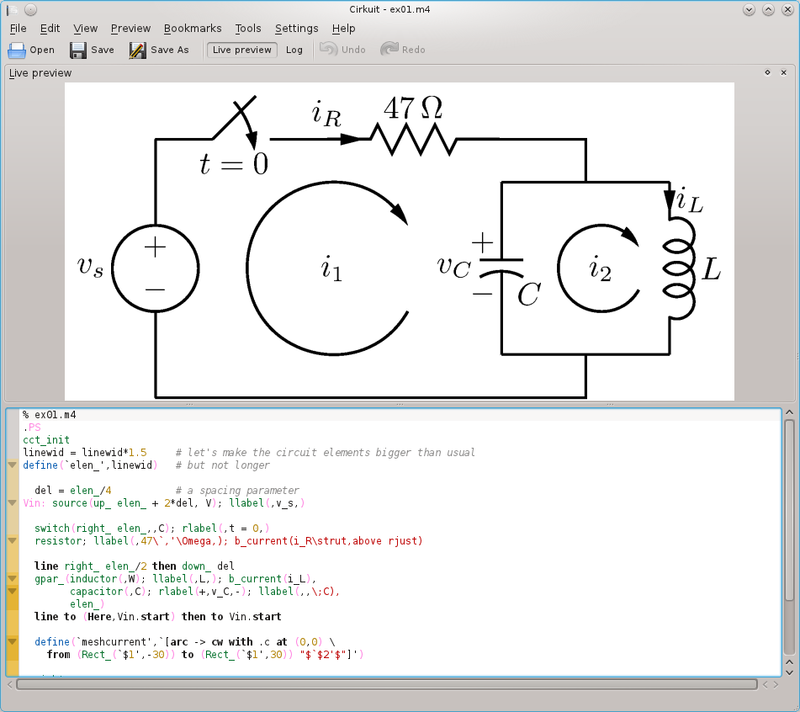 The main purpose of Cirkuit is to provide a KDE interface for various graphical description languages commonly used to generate publication-ready figures and plots. Cirkuit offers the opportunity to generate a live preview of the source code typed in the main window and to export the result to various popular graphic formats, such as PDF, EPS, SVG, PNG, JPG and others. Typesetting of LaTeX formulas is another important feature of Cirkuit. 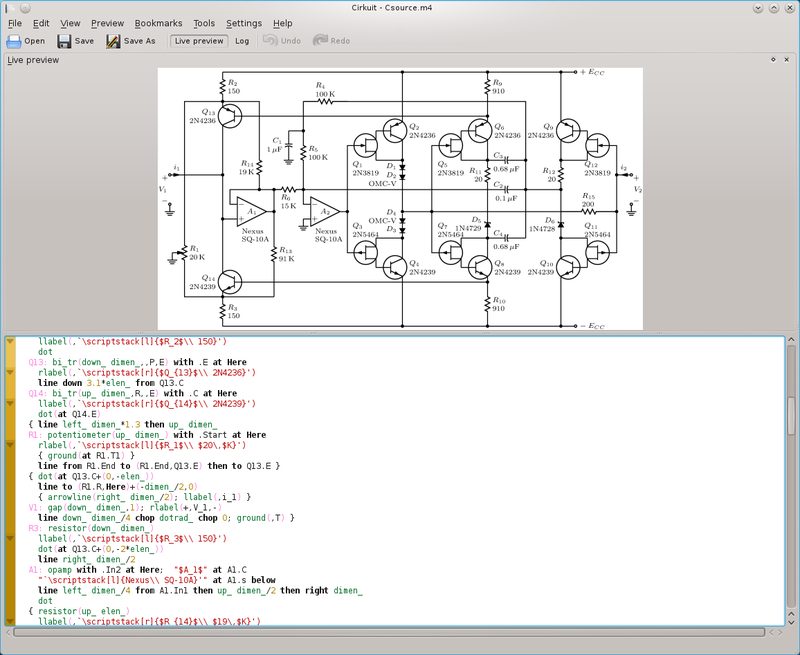 Initially Cirkuit was born as a GUI for Circuit Macros by Dwight J. Aplevitch. Afterwards, it has been extended to allow the use of additional graphical description languages. At the moment, there are three "backends": Circuit Macros, PGF/TikZ and Gnuplot. Cirkuit provides a unified interface and workflow to all the available backends. 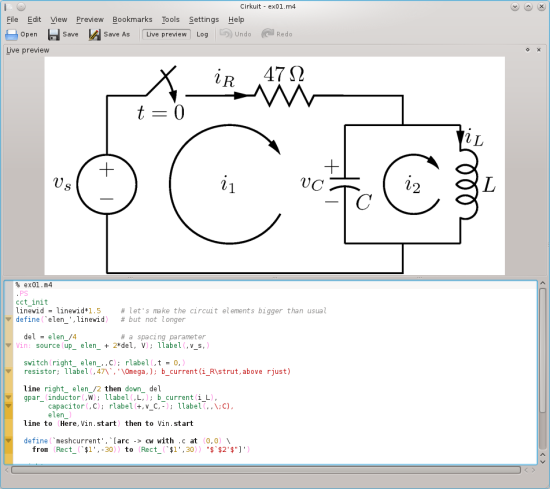 The Backend system is inspired by a backend used in another popular KDE scientific app, Cantor. Creating a new backend is fairly easy and users are invited to contribute their own. Cirkuit was born as a Qt application but it is now using a wide range of KDE technologies. The most evident to the user is the editor, which is based on the Kate part. Another features that is currently in development is the integration of Get Hot New Stuff, which will allow users to share their own graphics and templates. Behind the scenes, other powerful technologies such as KIO, KConfigXT and services/plugins are also used. Cirkuit is hosted on git.kde.org, currently in playground. The project homepage can be found here. Fix code-completion within incomplete function-macros, like "Q_ASSERT("
Properly skip hexadecimal numbers in pp_skip_number. The problem is that everything starting at the "x" is pre-tokenized into one IndexedString by tokenizeFromByteArray, so we have to handle the case that the input is not a single character. Fix a seldom crash that could happen while updating when one of the imported top-contexts has become invalid for an uknown reason. Instead of "Declare var as: | local int | public int | private int | Hide"
Show "Declare 'int var' as: | local variable | public variable in ContainerClass | private variable in ContaineClass | Hide"
Make sure that working sets are unique to the patch-review area before changing them. Remove unsupported Qt configure flag. dfe9084344d73d59f4569c8be6104ce83ae0df95, but it's apparently assumed anyways so the effect is still the same. Thanks to Maurel for the report. Possibly fix 262364 (l10n modules don't build if files updated). This fix makes it so that the build system for l10n modules is regenerated on every build (which has the side effect of running the required autogen.sh script). Seems to work for me, should be in 1.12.1 (when I do finally release that). Catch failed "svn status --show-updates". Disable the "Show SVN Updates" option, try again and print an info message. Work around http://bugreports.qt.nokia.com/browse/QTBUG-1313: When using mixed locale settings, LC_NUMERIC is used by Qt to determine QLocale::system().lang(), but LC_MESSAGES would be correct. #ifdefed for Maemo since the workaround is not portable. Fixes GUI messages coming up in the wrong language when using different language and regional settings on the N900. Limit the maximum zoom value to one closer to the maximum tile level. Zooming in very close has little practical use and causes problems when double precision is not available. The data entered by the user should have been validated in the respective pages. Thus, anything that goes wrong here is a programming error. Reset the model after adding a new variable. Additionally, this avoids unnecessary STL dependency. make the slider be shown again explicitely. Probably there was a change in behavior of KNumInput - need to investiage. * Rectangular region and freehand region grabbing have a weird behavior (screen does not go grey and you cannot select the capture area) which can be "fixed" by pressing ctrl + alt + del. I think this is something I broke lately because I'd say it worked fine. Node size increases on each new layout, do not save width or height to work around. Remove the focus from the lineedit before deleting to avoid a weird crash. Commented out all the debug statements. Cleaned up the coding style. * A window.open call followed by calls to resize or move the window. The amount of hack required to get this to work is on the same level as the history integration hack! 'Fix' the VideoDataOutput to run in sync. because setFrontendObject is no longer called. Fix implementation of DolphinView::invertSelection() which assures that DolphinView::hasSelection() provides a valid return-value. Don't trigger a slotDirListerCompleted() when the directory lister has been cancelled. Beside leading to a crash for the unit tests this is semantically wrong. This fixes the bug where daily backups would not always be performed. Add a process file for DragonFly BSD. It should fix compilation on it, as well as provide meaningful stats for it on ksysguard. Original patch by Alex Hornung with some minor style cleanups, thanks a lot! Forge the right URL for audiocd:/ to pass the device parameter and then address the right one. Fix kmanpart so that KHTML actually parses the output as HTML rather than as plain text. Include the desktop window from active screen in alt+tab. of the current active screen is picked. Not supporting folders, just claim it exists to not break clients checking the folder before accessing it. This fixes the IMAP akonadi resource + OS X keychain combination for me. Actually activate the critical battery timer. When sorting by completion, untie completed to-dos by completion date. Also, "sort completed to-dos separately" only makes sense if we're not sorting by completion date, so I fixed this too. Fix crash when losing network while trying to connect a new session. session then fails as well, at which point accessing m_account will crash. Don't ask to notify the organizer if the incidence doesn't have an organizer. Andris, I think this is the bug you mentioned some time ago. Remove the error dialog entirely. Remove the top-level search collection when there are no more search collections. I'm still not convinced this is the right way to do this, but it's at least a partial bug fix. Do not allow to delete system folders (e.g. inbox, sent-mail, outbox) by disabling the actions. Read also keywords and comments. Fix empty page was inserted just because the first paragraph was refering to a masterpage. DOC: Fixed a problem causing that some footnotes/endnotes were missed. This could be the final addition to the following commit. A report of problems I have detected will be sent soon the mailing list. Fix kword shakes / shivers while opening this attached document. Rewritten to output ODF rather than old-kword format. creator, especially since patterns are getting more and more useful. Fixed the _absurd_ error that was preventing everything from working!. Basically, I forgot to move a pointer forward (++) when a certain condition was met that didn't need treatment of the data. Nevertheless the pointer had to be incremented!. Now that was solved along with a possible division by zero pointed out by pippin. This new alpha-aware convolution was tested with all common colorspaces as well as the painterly framework, I am aware that it breaks convolution for the painterly framework but it fixes it for all other colorspaces!. before the current chunk. Skipping any uprocessed stuff at the moment. Don't process hidden chunks. This fixes issue 4 in bug 244411 . Fixed issue with TagDialog that make metadata fields stay editable if multiple streams opened. Make k3b the default handler for .iso files. Otherwise Ark is the default handler on openSUSE. Lookup in musicbrainz with the same device kscd tries to play. This is the same patch as has been committed in commit 1133816, somehow the change got lost since then. If the music cd is in /dev/cdrom[1-x] and not /dev/cdrom amarok failed to read the cd. Kudos to Kevin Ottens for the explanation. Hacking solid was no fun tho. These bugs please check if it helps for your problem too. This allows to set ipod covers again without crashing. pipeline a lot and thus opens the connection twice -> fail. Worked around it by explicitly preventing last.fm URLs to be reset. This is a follow-up on d9d27ca96e4a1e8c06aea03c8c4cddcbbd02daf7. Fixed issue with wrong handling of multyfiles cuesheets. here should fix that though. Hide playlist tooltip If It was disabled in playlist layout manager. Fix streaming of seekable streams. GStreamer tries to immediately buffer, which fails for filejobs as those get opened asynchronous. Fortunately gstbasesrcs can implement check_get_range which is basically used to indicate whether pulling is currently possible. So now we try to pull by running needData, wait for a 100 msec if no data arrived -> no pull, this is repeated by gstremer until we get data. Supposedly we should introduce a maximum amount of failed checks though. Fix crash on copying tracks between collection. Fix crash due to not properly cleaning up peers and everything related when switching to superseeding mode. Automatically refreshing bookmarks when editing them. Suboptimal solution. We probably need bk management model/view based to improve. Move timers out of Connection object and into UTPServer. This fixes a crash due to cleaning up timer in the wrong thread. Ensure that we get to do our error handling in ApplicationBackend before MuonMainWindow has a chance to reload things behind our back in the case that handling an error means reloading the QApt backend. Patch by Theofilos Intzoglou, thanks! Changed xsetwacom parameter from button 1 to just 1 and so on. Finally detect properly when a file has the needed features. Update a little the logic behind the incorrect import lookup. ** add checkboxes for "Coordinate Grid", "Populated Places", "Terrain", "Places of Interest", "border lines"
Bring support for vector and list derivatives so that functiontest succeeds. Successfully merged revisions in trunk in this branch! We have OpenGL and database compiling and running OK together. More work on the database coming soon. Set the default in GPSSearch to show thumbnails instead of markers. Chromatic Aberation Correction can be processed automatically now. The CA adjustement are computed using RawTherapee kernel imported in Libraw, instead old dcraw method. Add new Noise Reduction Chrominance Threshold implemented in current libkdcraw to support Impulse Denoise method. Marcel, This patch is enough to support Image Versionning here ? Use a listbox with 6 maxentries on mobile devices. The priority list should now be scrollable. 6 Items are the maximum that are shown before they are hidden under other dialog elements. Redefine the update order of the three elements clock, date selector and am/pm switch to avoid incorrect circular updates. The date selector always contains the right date and the other elements are updated according to it. Committing "progress" for today, filters that use the FFT convolution worker like blur still do not work. My copybook math says that convoluting channels premultiplied by alpha and then dividing them by the convoluted alpha channel will yield correct alpha-aware convolution. I only managed to demonstrate that (to myself) with values ranging from 0 to 1. I suspect my current failure is due to multiplying values between 0 and something >1. But I tried dividing by 255 and testing in 8 bit images and it still doesn't work. DOC: Added initial support for the TOC field. Added support for the most important instructions of the TOC field. originally created by MS Word. Added a color selector mode. In this mode it should be easier to see and pick a color in relationship to lightness, darkness and value. Allow to define a template to read per default and fully skip the template selection gui. Improve the user experience by not locking up plasma when launching an application. AKA use the correct dbus service name in the application .desktop files so that kde knows the application is started. Finally apply the patch from Matus Hanzes to have picture's as hyperlink in calligra words. Handle date and time fields/variables in msword 95-2003 documents. This is related to bug 262729 but does not fix it yet cause it seems the date-variable is not displayed wtih Calligra Words but only if the produced ODT is loaded with oowriter. Will try to find a solution for it now. One problem: they are not yet painted in the right place on the canvas. Port haze(-icq) plugin to the new plugin api. Port gabble plugin to the new plugin api. Copy gabble plugin over to haze folder and replace gabble with haze icq. No implementation changed in the icq-specific classes. Make the haze icq plugin load. Update the completion list when the user switches search engine on the fly. Port idle plugin to the new plugin api. Port butterfly plugin to the new plugin api. New VertexBuffer and VertexAttribute classes, moving the rendering out of Mesh and easing the creation of custom meshes with more vertex attributes. New modular config dialog system. Many new configure options. And many changes in everything that has to do with it. * Add a parameter "preferProxyContext" to "DUChainUtils::standardContextForUrl". Only proxy-context know exactly about all the includes, and thus they need to be used when deciding whether the duchain needs to be updated. * After switching the document and after refactoring, decide whether the duchain needs to be updated based on the proxy context. In C++, this fixes the problem that often the files weren't updated even though one of their included headers was changed. * Do not rely on the background-parser to assign the DocumentChangeTracker to parse jobs. Instead, retrieve the tracker while reading the contents. This fixes the problem that often files were not updated correctly, specifically after an assistant with cross-file effect was used. * Remove lots of unneeded code from ParseJob. Use a less dirty approach to reparse all projects files. Refactor some of cpp code completion context, fix a few things, add tests. Bug 244774: Kdevelop auto-changes "this->someVar" into "this someVar"
Refactor the Map Creation Wizard to make use of all the tag writer classes introduced instead of the QXmlStreamWriter. Make it possible to provide derivation rules as a pattern and a conversion. It simplifies a lot the derivative solving process and opens doors to new applications of this method elsewhere. More work on the port to Windows. Internal simplification: It is not necessary to keep the ViewModeController as member for the view-modes, as the URL is alredy known by the DolphinViewController. Encapsulate the creation and handling of the directory lister, the model and proxy model to DolphinView. By this it will be easier later to replace the traditional QAbstractItemViews by any kind of other implementation (e.g. 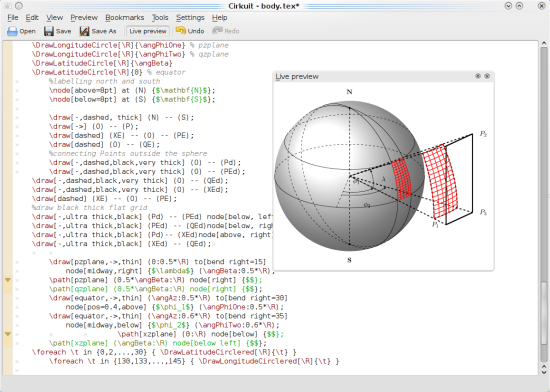 based on QGraphicsView/QML). an entire pixmap cache just to cache the values of the group sizes! it used to be used for many more things, which made this more sensible. this "frees" KIconLoader from KIconCache and therefore also KPixmapCache. we can now remove the class in "KDE5" as noted in the comments in the header. Optimize WinCE db performance by removing indices. also the difference we saw benchmarking many insert statements. Use more suitable links in rendered kjots books. tooltip string until the item is shown. 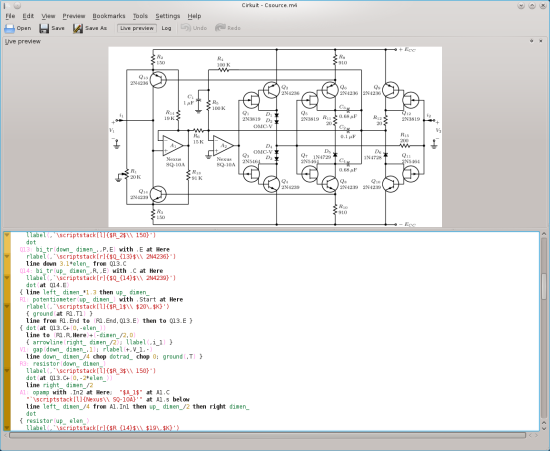 single rowsInserted() signal of the model. Cache the startDate() and endDate() values for subsequent use in MonthItem::updateMonthGraphicsItems(). When the "default calendar" isn't set, choose a good fallback, instead of a random calendar. Now if you open an editor it will preselect a calendar that you have selected in the resource view. Very handy if you only have one selected. Made the KoCompositeOpCopy2 work properly and used this mode for the smudge brush. is created by a method that involves instantiating a KConfig object. tooltip shortly before it is shown to the user. Improved text styling in pptx filter. Skip the template selection gui in Calligra Words per default. Make KoUpdater::setProgress a slot so we can directly connect a signal to it. Move the loading of the main text to words so we can get the progress while loading. Replace direct calls to _incidenceview with signal/slot connections. Subject to backport to stable branch. We should test this as much as possible before we backport though. Update balance of investment type accounts upon modification. o connect loading data structure with toc generator. less convenient but makes opening the pattern editor much faster. Enabled predefined shapes in drawingML (aka autoshapes). Update breadcrumbs on service insert/remove. Cleanup argument handling for gstreamer. Rather than expensively building an argv on the heap we just make one on the stack and fill it with data from QByteArray's or static const char* (as required). Then we just cast that to non-const char** so that gst can work its magic. 1. Hide new tab entry if it is not necessary. 2. Print and Search action: I removed the print action. The search action is now in the "search with" submenu if some text is selected. 3. Hide the development menu entries and add an option to show them. Cache generated GtkRC to prevent costly reparsing of files. reduced inner margins for GtkEntries (and affiliated) to match KDE better. moved includePackage() into InstallerEngineConsole and refactored, need to be extended to support new compilers - the same could be done with the package manager and end user package including part to have a common interface. Remove some unused include files by using KDevelop's include manager.